This page details two modifications The first part should be done to all controllers with serial numbers below 4028. After that, the modification was included in production. Modification is to the top (control) board. Disconnect the battery before working on the controller. The control board is held in by four screws in the corners. The resistors can easily be snipped out with a small pair of cutters, but take care not to damage any other component. This modification deactivates a part of the circuit which is not actually useful and which can occasionally cause switching problems with the more modern MOSFETs we are now using – even leading to failure, or vary rarely runaway from half to full power. The two 100K resistors shown in red should be removed, it is easiest to simply cut them out with a pair of cutters. This capacitor suppresses a slight jerk in the motor as the high pot lock-out resets. It is less important than the first part so is optional. It was incorporated as a production modification from serial number 4123. 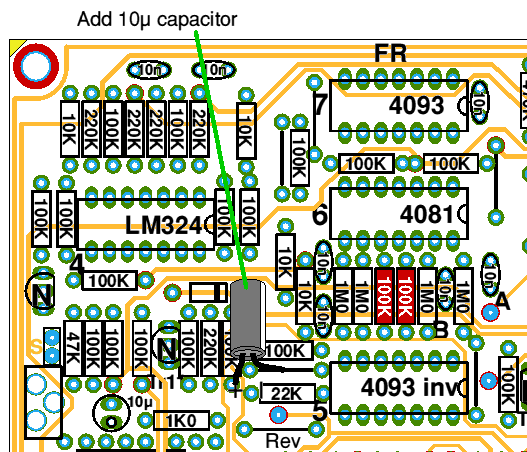 A 10µ capacitor (12v working is adequate, higher voltage is fine) should be added as shown. Negative lead connects to the link (which is controller ‘earth’) and positive connects to the end of the 100K resistor as indicated.